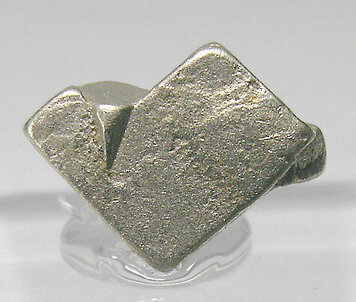 An exceptionally sharp Platinum crystal, floater, complete, with two other twined crystals. From the old good times for Russian material, pictures say everything : quality, luster and perfection. We analyzed it and it is pure Platinum, we will send a copy of the analysis to the buyer of the specimen. Floater aggregate of very sharp and bright Platinum crystals. They are cubic and slightly beveled by the dodecahedron. The sample is from one of the great classic localities for this native element, from which almost exclusively come well crystallized samples.